Great savings! 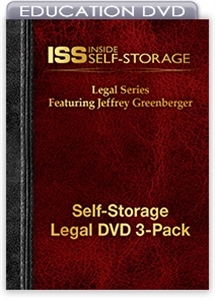 This 3-pack of self-storage legal DVDs provides a more than 30 percent discount on individual prices and offers in-depth expertise that will help you avoid litigation and liability. For more detailed descriptions and previews of DVD content, please refer to each individual product page by clicking on the linked title. These products are also available as an on-demand video.